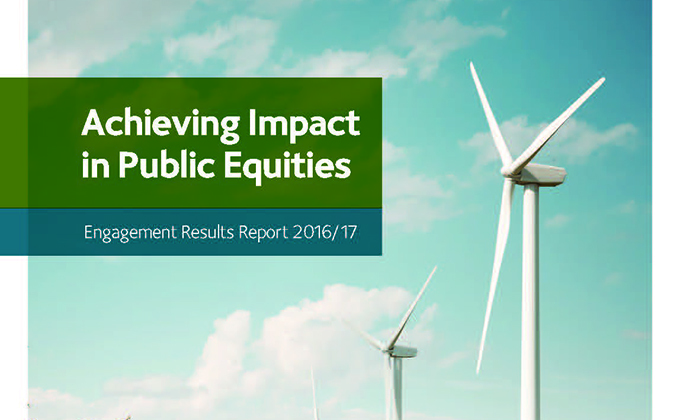 We are excited to share our first annual Engagement Results Report, Achieving Impact in Public Equities, which highlights our ESG (environmental, social, and governance) performance for the 2016 calendar year. As a result of our efforts, 44 companies made noteworthy changes or commitments with regard to their products, processes, or policies in 2016. We engaged over 190 companies around the world last year; 122 of these dialogues were led or co-led by Boston Common. In addition, we worked to improve ESG metrics in critically important areas like climate risk, human rights, and chemical toxicity. The role of Public Equity investors in creating impact is often overlooked. As investors, our unique access to corporate managements enables us to demand transparency and accountability. We can use this voice more intentionally, to embolden companies to lengthen their planning horizons and manage risk and opportunity for the long term. At Boston Common, we proactively engage with portfolio companies around the world to help navigate complex issues like climate change and supply chain management. As you’ll read in this Report, our team brings the mature voice of experienced investors to the table, leading to meaningful changes within companies. On many occasions, we amplify our impact by building multi-trillion dollar investor coalitions, or by taking a leadership role in preeminent global investor networks such as the UN-supported Principles for Responsible Investment (PRI), Ceres, and the Interfaith Center on Corporate Responsibility (ICCR). In some other instances, dialogue behind closed doors may give our call for change a better chance for success. We are proud of our significant impact last year, but also mindful of the many urgent, transformative changes required for a more sustainable, inclusive future.